Israeli lobbyists have cowardly vandalised an #IsraeliApartheidWeek (IAW) Palestine billboard near Johannesburg's OR Tambo airport. The billboard was put up earlier this month as part of the recent #IsraeliApartheidWeek campaign. Click here for SABC TV news coverage of the issue. A case of malicious damage to property has been opened at the Kempton Park police station and we look forward to the SA police services finding the perpetrators and having them face the full might of the law. Israel and its supporters have turned to suppressing of expression by defacing the #IsraeliApartheidWeek billboards. We may disagree with and oppose the Israeli regime but we urge tolerance and respect and not these bullying and intimidating tactics by Israel and its supporters. Prince Zulu, representative of the billboard media advertising agency company said: “We are very disappointed by the reaction of some South Africans and their utter disrespect. Regardless of their political opinion why must they resort to such tactics? My small black owned business is now affected because of the actions of intolerant Israeli supporters. Personally, this was one of my first clients in the Ekurhuleni area. I was also proud, in the year that we are celebrating Oliver Tambo, to be associated with this billboard near to OR Tambo Airport as the Palestinian cause is in line with the principles that Tambo the man stood for”. 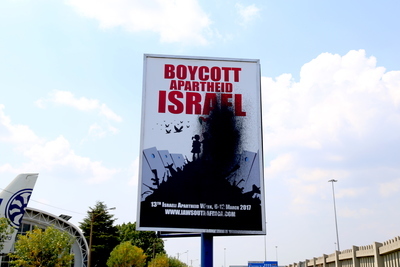 The SA Jewish Board of Deputies and SA Zionist Federation had previously tried to remove billboards that the Palestine solidarity organization BDS South Africa and the PSA had put up with pro-Palestinian messaging, falsely accusing BDS SA of anti-Semitism. The Israeli lobby failed in their previous attempts to have the PSA/BDS SA billboards removed with the High Court declaring that the PSA/BDS billboard was legal and should remain. Click here for photos of the billboards. Alex Mdakane, National Spokesperson of IAW in South Africa [+27 (0) 785268663] or Nabeela Sujee, National Convener of IAW in South Africa [+27 (0) 726370386].